The dual attack of our increasingly digital lives and the policies of austerity has been mostly bad news for libraries, with many closing each year. If nothing else, this should make us thankful for the beautiful ones that remain in the UK (which happens to be the home of some of the most stunning in the world). 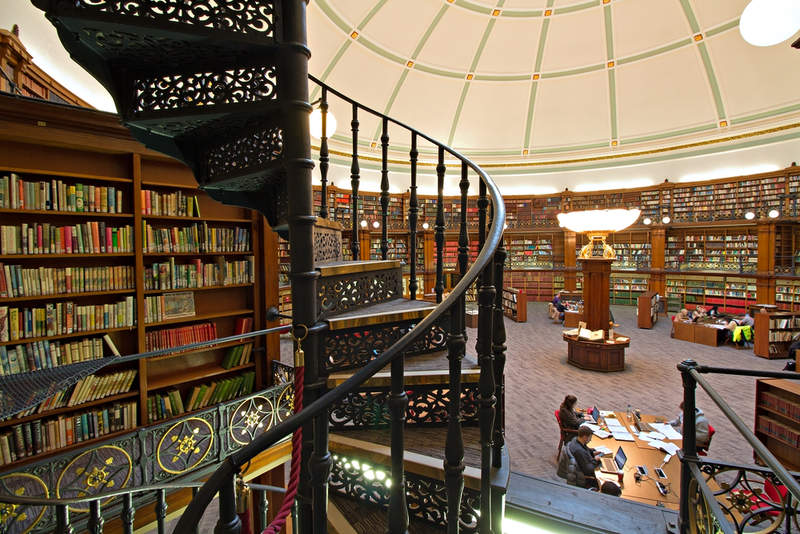 Discover nine of the best with our guide to beautiful public and university libraries across the country. 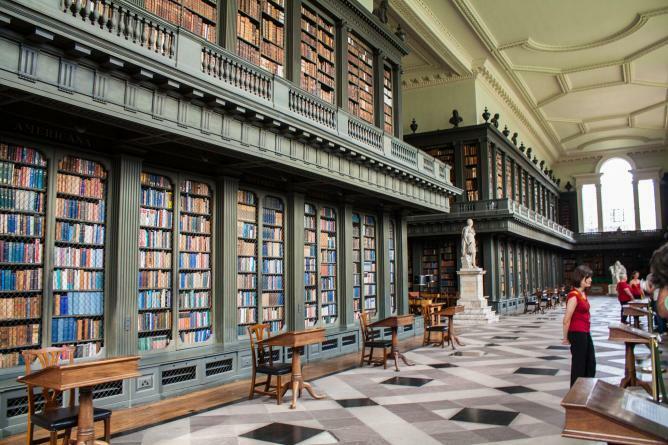 Aside from Oxford’s Bodleian libraries, each Oxford college has its own library. Perhaps the most impressive of these is owned by All Souls College. Completed in 1851, the Codrington Library truly is a vision of monochrome perfection, as bright white marble statues meet rows of black bookcases. This simplicity saves it from being overly grandiose (which is not to say it is not staggeringly grand) and protects it from being kitschy – a fate not all similar libraries escape from. Sadly not open to the public, the Codrington Library is open to members of Oxford University by application, and to researchers by appointment. A devastating fire ran through the library of the Glasgow School of Art in 2015. Although the Grade I listed building was mostly undamaged, its contents were almost completely gutted by the flames. This is a great shame, for the library represented one of the most singular visions in Art Nouveau design. Charles Rennie Mackintosh designed everything from the furniture to light fittings, creating an atmosphere and artistic triumph that has inspired some of Britain’s most successful artists, as alumni of the school. 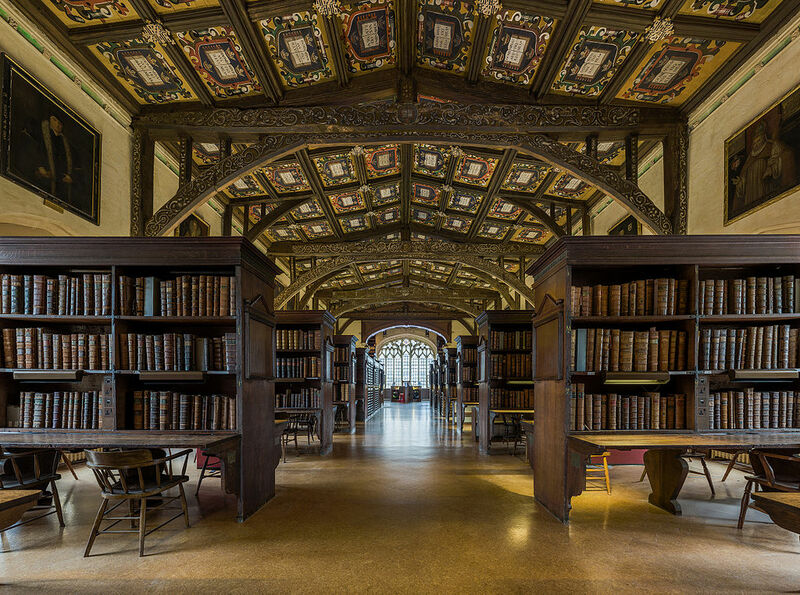 Oxford University’s Bodleian is one of Britain’s six legal deposit libraries (another features later in the list), meaning it is legally allowed to request a copy of every book published in the United Kingdom. These are housed in one of the Bodleian’s five main buildings, from which it is incredibly difficult to choose a true favourite. Each has its charm, from the arresting arches of the 15th-century Divinity School building to the round English Palladian building of the Radcliffe Camera, to the carefully austere New Bodleian built during World War II. Membership is required for admission to the Bodleian, with tours available for the general public. 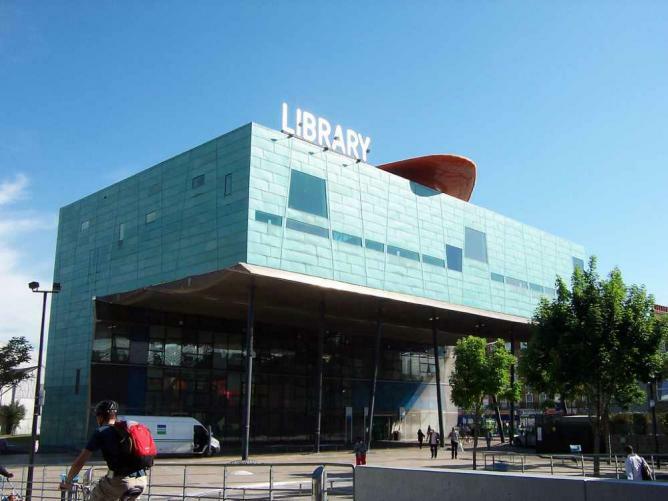 A controversial choice, but fans of modern architecture will find much to love at this library in Peckham, South London. Even die-hard classicists cannot help but be astounded at how the building remains standing, with the top-heavy structure only supported by a series of spindly pillars. A winner of the prestigious Stirling Prize for innovative architecture, its glass and metal design is a million miles away from the staid and stuffy libraries people remember unsoundly from their childhoods, and it is this openness that leads half a million people through its doors every year. Once famously called “the finest drawing room in Europe” by King George IV, it is perhaps better known as an events space – one of the most perfect venues for weddings or special occasions in the city – than as a library. However, it is still a working law library, as it has been since it was built in 1822. Full of grandiose columns, balustrades, and elegant details, there is so much to draw the eye that it is a surprise the solicitors who own the premises ever get any research done. 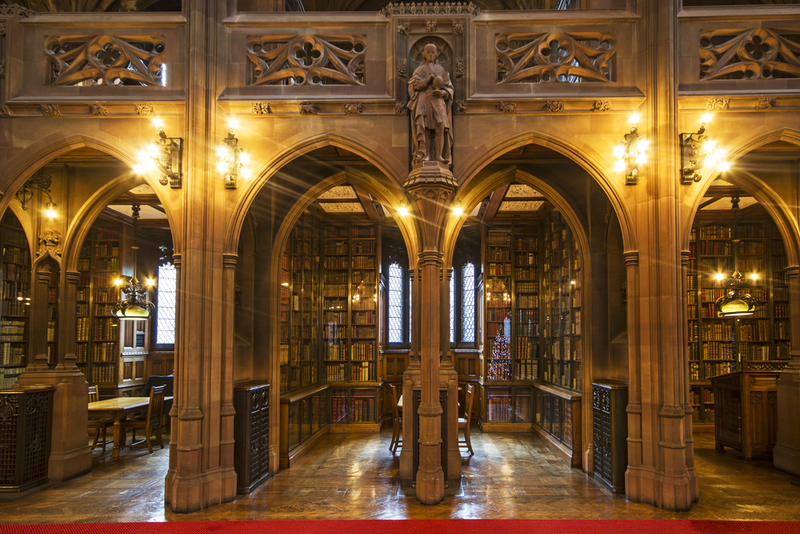 Another of the great neo-gothic university libraries, the University of Manchester’s John Rylands Library is one of the most stunning examples of the style. Though from the outside it could be easily mistaken for a church or even a cathedral, it actually holds hundreds of thousands of books, including an impressive collection of early printed works such as the Gutenberg Bible and a Caxton Canterbury Tales. In fact, it is difficult to know what to be more impressed by, the stunning vaulted ceilings and Arts and Crafts touches or the impressive collection of rare books. Originally the Public Records Office (now found in a quasi-brutalist building in Kew), the King’s College London library, the Maughan, is full of surprises at every turn – secret stained-glass windows, statues of Confucius, and a round reading room that was turned into Dumbledore’s office for the Harry Potter films. Its neo-Gothic exterior is often at odds with its interiors, where modern students’ needs meet remnants of old offices and an intact medieval chapel. In no way architecturally cohesive, this only adds to the charm and the wonder of the building. Membership is required for admission. 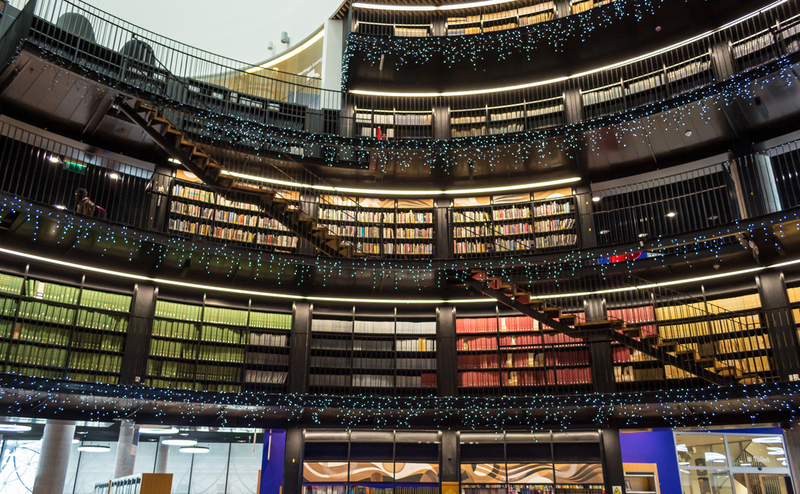 Unlike many on our list, the Library of Birmingham is a public library open to all, and is a must-visit for fans of contemporary architecture. Its exterior is a ziggurat of sorts, a stack of blocks that light up and have made the library a much-loved feature of the Birmingham skyline at night. By day the exterior is equally gorgeous, with an intricate geometric latticework uniting the three sections. The interior is strangely at odds with this, all circles where the outside is squares. Somehow, however, this is carefully balanced, making a unique treat for bibliophiles. Despite being much loved by residents, the original interior of Liverpool’s Central Library began to fall apart thanks to the combination of lack of conservation and age. On the positive side, however, this led to a 2013 £50 million revamp. Complementing and contrasting the existing areas was a new foyer, built around a Guggenheim-like spiral leading ever upwards to a domed skylight, flooding the building with light to better accentuate its design. Now classic and contemporary mix across the library just as authors from the past and present meet on the building’s many bookshelves and in the minds of the readers who populate the library.